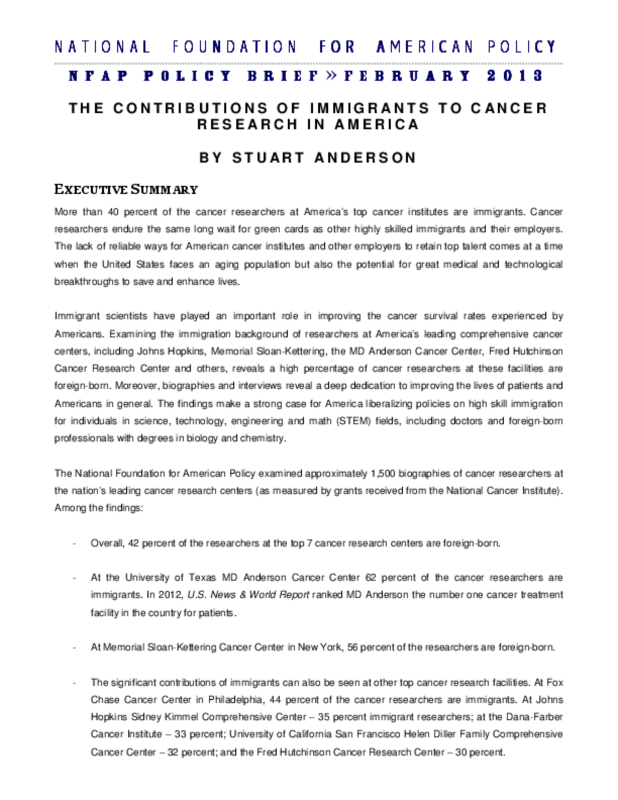 The report discusses the contributions of immigrant researchers and details the immigration difficulties experienced even by top cancer researchers. The study analyzed biographies of approximately 1,500 cancer researchers at the top cancer institutes. In "The Contributions of Immigrants to Cancer Research in America," the NFAP research shows that cancer researchers often wait years for permanent residence and endure the same long wait for green cards as other highly skilled immigrants and their employers. The study shows immigrant scientists have played an important role in improving the cancer survival rates experienced by Americans, and thus stresses the importance of allowing immigrant cancer researchers and others in medical-related fields access to additional green cards in future immigration legislation. The report includes profiles of leading immigrant researchers, as well as a historical look at the contributions of immigrants to cancer research. Copyright 2013 National Foundation for American Policy (NFAP).